Be sure to check out my review of Strange, Sweet Song! You can find it here. 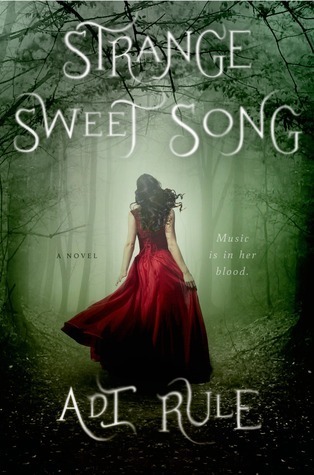 A Midsummer Night’s Read (AMND): Adi, thank you so much for stopping by our blog and giving us the opportunity to pick your brain about your wonderful novel, Strange, Sweet Song! Adi Rule (AR): Thank you so much for having me! I’m thrilled to be here. AMND: Did Gaston LeRoux’s Phantom of the Opera or Andrew Lloyd Webber’s Phantom inspire you during the plotting and writing process? I actually was thinking this prior to your character’s actually mentioning it! And if they did, which do you prefer? LeRoux’s or Webbers? AR: I didn’t have The Phantom of the Opera in mind in terms of adapting it or using it as a framework, but I love that story. I’m sure it influenced me under the surface. The original novel is so beautiful and heartbreaking! As far as adaptations, I think my favorite is Phantom by Maury Yeston and Arthur Kopit. The music is gorgeous. (And it was the first big show I was ever in, when I was 14. I was in the chorus and had one line and a scream.) I like Andrew Lloyd Webber’s adaptation, too, but for me, ALW is all about Cats! AMND: The dynamics of Strange, Sweet Song remind me of whether you planned the main character’s storyline to mimic Christine’s and focused on the possibility of what could have happened had the Phantom been more humanized and lovable. Is Ryan supposed to be a Raoul and Nathan a Phantom? AR: That’s an interesting question. I think the Felix is the closest thing to a Phantom of the Opera in this story. She’s homicidal, a bit mythical, and was once grand and glittering but has been cast low. Nathan has quite a lot of bitterness going on as well, though, and he does have the creepy tower and dark mentor angle. And Ryan is the handsome, popular guy, just like Raoul. But Nathan’s intentions are pure, like Raoul’s, and Ryan is more about advancing his personal agenda, like the phantom, so in that way I think they’re opposites. Sing’s rising star, met with equal parts jealousy and adoration, does mirror that of Christine. They’re very different people, though. Sing isn’t an ingenue off the street; she has been raised in the highly competitive world of classical music and groomed to succeed. She also is very much in control of her personal trajectory, whereas Christine always seemed to me to be a lovely, precious object that is manipulated for good or ill by stronger forces. AMND: Your bio states that you are a soloist and chorus member at the Boston Symphony Orchestra. Are you a soprano like Sing? AMND: What is your favorite piece to perform? AR: My favorite audition piece is “Je veux vivre” from Gounod’s Romeo and Juliet, my favorite choral work to sing is Brahms’s A German Requiem, my favorite role was the Witch in Into the Woods, and I’m not sure I could pick a favorite karaoke song. Some friends and I recently utterly demolished “Buddy Holly” by Weezer. It seemed like a good idea at the time. AR: I’m so glad you loved the characters! I’m very attached to them, too. It’s a standalone right now — my next book from St Martin’s is a whole different cast — but I’ve definitely kicked around some ideas about where the characters in Strange Sweet Song would go next. AMND: Do you have any advice for readers who are aspiring writers? AR: I find a lot of people are looking for someone’s — anyone’s — permission to write. So that’s the first thing, just knowing that you don’t need anyone’s approval to do it. Go for it! The second thing is to read and write a lot. A lot lot. All the genres you can put up with. When you’re ready, find a person or people who can give you honest, helpful feedback. (So no bullies and no cheerleaders.) Write, revise, repeat. Remember the best and most efficient route to publication, if that is your goal (and for many writers it isn’t, and that’s totally fine, too), is to create the best, most polished stories you can. AMND: Thank you so much for taking the time to speak with us, and we are looking forward to your next novel, Redwing! Be sure to pick up a copy of Strange, Sweet Song–you won’t regret it!